The first demonstration of viability of expandable habitat technology. The first step in validating our architecture was to demonstrate successful deployment and expansion of the structure in low Earth orbit, which Genesis I and II both accomplished. Launch our first spacecraft in the US? Not an option. Prices were too expensive for domestic launch vehicles at the time. Mr. Bigelow was forced to look elsewhere for affordable transportation. Genesis I and II were both launched on converted Russian ICBM’s, also known as ‘the Dnepr’. Genesis I was launched on July 12, 2006 at the ISC Kosmotras Space and Missile Complex near Yasny, Russia. The launch, deployment and operation of Genesis I was successful. Just under one year later, on June 28, 2007 we launched our second iteration. Genesis II was also launched from the Kosmotras Space and Missile Complex near the town of Yasny. This spacecraft was also a success. We were in contact with both Genesis spacecraft for much longer than expected. Communications onboard were nominally expected to last for six months. However, we were in contact with both spacecraft for over two years. Currently, both spacecraft are in orbit, and are being pulled back towards Earth and will someday safely burn up in the atmosphere. Genesis I was launched on July 12, 2006 at the ISC Kosmotravs Space and Missile Complex near Yasny, Russia. The launch, deployment and operation of Genesis I was successful. Happen to look at our website back in 2007? Then you may know that for $299 you could ship us a small payload to fly aboard the Genesis II spacecraft. We received all kinds of items from ashes to pictures to business cards. We successfully photographed every item we flew in orbit for our customers. Bingo anyone? This was our first try at entertainment in space. The bingo game was going to be broadcasted on our website- unfortunately, the arm got hung up during the first attempt. Advertising in space? We've been there. 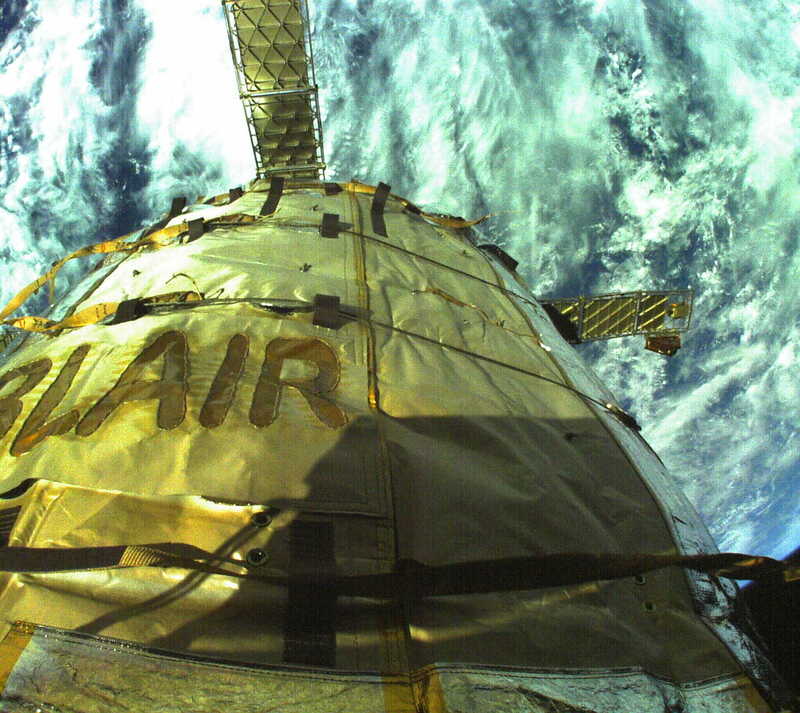 We used a projector and a paired camera to turn the outside of our spacecraft into a billboard. For fun, every employee's photograph was projected onto the exterior of the spacecraft. Prior to launch, Mr. Bigelow had his grandaughter's name, Blair, stitched on the outside of the spacecraft. Genesis I & II are identical in length and volume. However, Genesis II had more capabilities, including the addition of 10 cameras; bringing the total number of internal and external cameras to 22. These modules served as a successful proof of concept for our architectures, including the B330.